North Carolina’s Outer Banks is renowned for its beauty, history and great fun in the water. In 2017, they will be known for one of the world’s newest and innovative new waterparks, as H2OBX is slated to open in summer of 2017. The new waterpark has just broken ground, and will feature more than 30 different waterslides and attractions. The new park is also being headed up by one of the leaders in waterpark development and technology, the Aquatic Development Group. 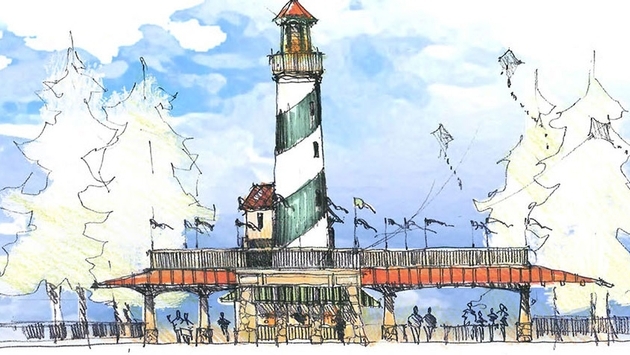 The new water park will be located in Powells Point, North Carolina, building on the architecture and feel of the area, and will have everything from their own lighthouse to pirate ships, and even the first ever airplane, the Wright Flyer. The new waterpark will concentrate on bringing unique guest experiences to hundreds of thousands of families who not only vacation in the Outer Banks ever year, but also to those who live in the area as well. Aquatic Development Group (ADG), who is the main group behind the development, is no stranger to waterparks. They have been an industry leader for years, and will be bringing the new park to life. Some of the new attractions will include the Twin Tides wave pool. Think if your standard wave pool never ended at that big wall that’s so common in other parks. Other attractions will include tube slides with dazzling light and sound experiences, as well as thrill drop slides that have the floor come right out from under you. In addition, the park will include at least four food and beverage locations, and 50 cabanas. Guests can plan on spending the entire day, and can find a place to relax. The new waterpark is expected to bring over 200 full-time and seasonal jobs to the area. More details and an opening date will be released in early 2017 as the park progresses.